SBHIS Insurance Services is an insurance agency with rigorous standards and highly qualified professionals that specialize in products related to Medicare. Our commitment to quality, integrity and education has earned us a trusted name in the communities we proudly serve. We have worked hard to earn a loyal following of clients that trust us. We work even harder to keep them and provide a lifetime commitment to service. Develops, plans and implements the outreach (community and member) programs, and marketing strategy for events, activities and outreach to interested candidates and members in compliance with CMS regulations for Medicare/Medicaid and according to the prescribed rules and regulations of the Medicare/Medicaid Contract. Implements community programs throughout the service area with the purpose of (1) providing meaningful programs for community residents including marketing and education of SBHIS Insurance Services products directly resulting in membership growth, (2) strengthen member relations through specific marketing and education initiatives resulting in greater member retention (3) building community coalitions partnerships to specifically increase enrollment and member retention and (4) promoting SBHIS Insurance Services programs and related initiatives. 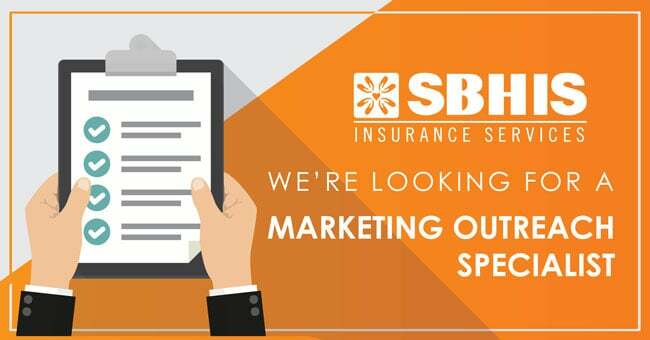 Promotes SBHIS Insurance Services products and directly assists with accomplishing outreach and enrollment goals. Organizes and develops successful marketing enrollment events. Develops and maintains relationships within the business and community organizations. Contacts facilities in service areas to arrange meetings, ensuring all locations meet CMS requirements. Provides direct member outreach including education through multiple channels, i.e., telephone outreach, new member orientations, individual member meetings. Participates in strategy meetings as necessary and make recommendations regarding SBHIS Insurance Services projects. Assists in preparation of all marketing and education events, activities and all presentations to eligible candidates, community partners, provider partners, etc. Assumes other responsibilities as required or requested by upper management. 2+ years of sales and/or marketing. Experience in HMO/Managed Healthcare or Insurance Industry. The employee must be flexible to work or to swing shifts.